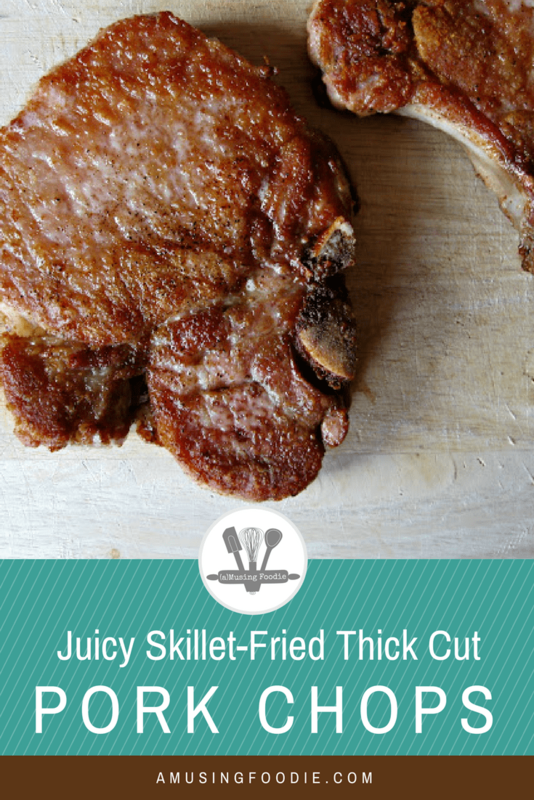 Juicy skillet fried thick-cut pork chops are a favorite in our house. Easy to make on a busy weeknight and fall-off-the-bone tender! I was flipping by Food Network the other day and managed to catch an episode of Good Eats where Alton Brown was busy searing a couple of thick pork chops in preparation for a few hours’ roasting in a slow cooker. He had sliced apples and caramelized onions ready to go, along with a pan sauce lovingly finished off with butter and scraped bits from the bottom of the pan. Thick, juicy and seared just enough in a cast iron skillet (or a regular skillet) to make a nice crust; we needed to have those NOW, with summer accouterments like salad and corn on the cob. It’s amazing how food can bring so much comfort in just a few bites. Those crispy bits make for a super delicious homemade gravy, too, if you’re in the mood for perfect mashed potatoes. I mean, is there ever a time to not be into mashed potatoes? It’s an easy dinner recipe for a weeknight summer supper. 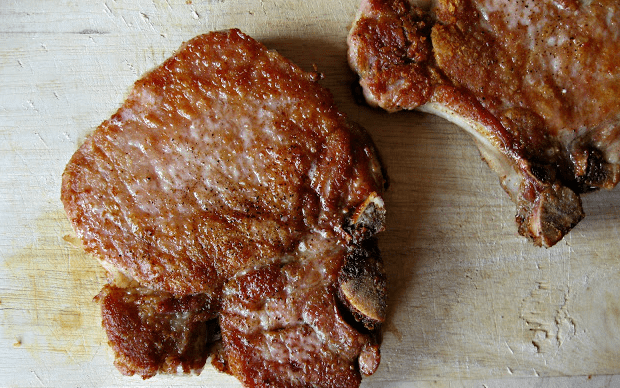 Juicy skillet-fried pork chops are a favorite—easy to make and fall-off-the-bone tender! 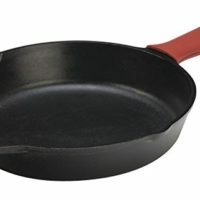 Add the olive oil and butter to a large skillet and place it over medium-high heat (on a heat scale of 1 to 10, I have my burner set around 7 since they'll be in the pan for such a long time). Sprinkle half the salt and pepper to one side of the chops. When the butter has melted and started to foam, add the chops to the skillet seasoned-side down. Season the other side with the remaining salt and pepper. Allow the chops to sear for 5 minutes, and then flip the chops. Continue cooking them on the second side for 10 minutes, and then flip the chops one more time. Cook for 5 minutes more, and then remove the chops to a plate to rest for 5 minutes before serving. *Set the pork chops out on the counter for about 20 minutes prior to cooking so that they warm to room temperature; this helps ensure that they're evenly cooked, all the way to the center. 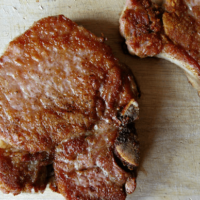 If your pork chops are thinner, you'll need to reduce the cooking time. 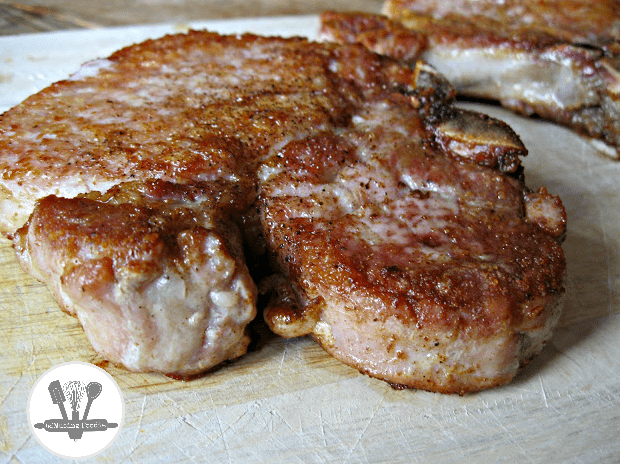 1-inch thick pork chops probably only need a 5-minute sear on each side, followed by 5 minutes of resting afterwards. I just made this recipe and found it way too salty. Is the measurement of the tablespoon of sea saltlt for two pork chop suppose to be a teaspoon? I tried your recipe. I usually buy & cook thin pork chops. I did as your recipe said. For me the pork was tough. I think it needed to go low & slow in the oven. These were nice bone in chops. 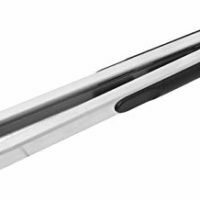 Sue – how thick were they?